54 cal muzzleloader CYLINDER Leather bag with 31 RB bullets. Description: 54 cal muzzleloader Leather bag with 31 RB bullets. Muzzleloaders! CYLINDER shape brown suede leather bag is 5" high and has a 3" circular bottom. 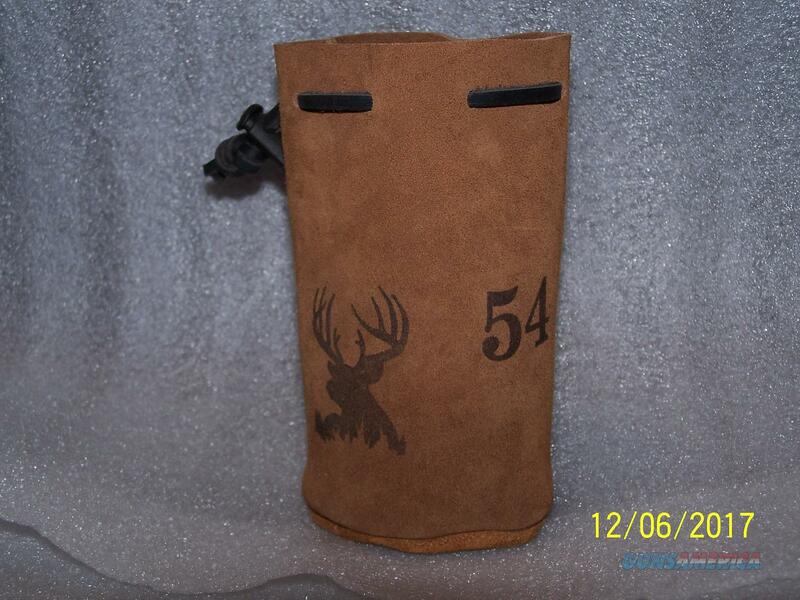 This bag is stamped "54" in permenent black ink, along with 2 buck deer silhouettes. This very nice bag can easily hold 100 RB bullets. Each is hand made in the USA with quality 4 oz very nice light brown suede cowhide leather, sewn together with Nylon Z69 thread for durability and strength. Each bag has a drawstring made of leather also with a black plastic cord lock. This sale includes 31 soft lead round ball bullets (1 lb of lead). Each bullet is .530" in diameter. Each bullet is cast soft lead and then hand rolled for uniformity. Each bullet weighs about 224 grains and are for .54 caliber muzzleloading firearms. Actual diameter is .530" to be used with a lubricated patch. Lubrication and patches are NOT INCLUDED. ** This would make a great gift for your shooting or hunting friends or EMPLOYEES! NO FFL is required for shipping - it is delivered straight to your door. HOWEVER IT IS THE BUYERS RESPONSIBILITY TO CHECK STATE AND LOCAL LAWS FOR THE LEGALITY OF PURCHASING BULLETS OR AMMUNITION COMPONENTS. Seller assumes no responsibility for hazards using this product. WARNING - THIS PRODUCT CONTAINS LEAD. ** Shipping is FLAT RATE $7.00 USPS SMALL BOX PRIORITY MAIL, insurance and tracking included in shipping price. PAYMENT - I prefer USPS Money Order, but do accept MO, Certified Checks or Personal Checks. Keep in mind that personal checks will be deposited for 7 business days before shipment is made.